Ozone 2018 high EN-B has arrived. There’s a mild shark nose, barely visual. The cloth on the Rush 5 seems heavy duty, and the lines are similar to the Rush 4 ones with a bit more diameter on the Middle A lines. I flew the Rush 5 in MS size (75-95) for 3 consecutive days in good conditions. Flew it in turbulent, sometimes weak, and sometimes strong and difficult. My take off weight was from 90 to 93 all up with an X-rated 6 harness. At that weight i never felt that i needed to be heavy on it. It worked fine. Take off in nil wind is slow on the Rush 5. It doesn’t have a hard point, but it’s slow to reach overhead. In stronger breeze, it launches beautifully without any surge forward which is a plus and comfortable launching behavior for a high B wing. The last tested Ozone high B was the Rush 4 MS size. I flew that glider sometimes in this past year and i still remember the light brake pressure, the good manoeuvrability and the slow trim speed. Some pilots commented that the Rush 4 needed to be loaded at top in order to bump less into thermals. On the Rush 5, the trim speed is as fast as the Mentor 5 or the Chili 4. There is slightly more pressure on the brakes over the Rush 4. I personally like that better feel on the brakes. The agility in turns is very slightly less than the Rush4, but still, i can say that the Rush 5 is a fairly agile glider that can core any weird thermal, but with a very efficient turning radius. 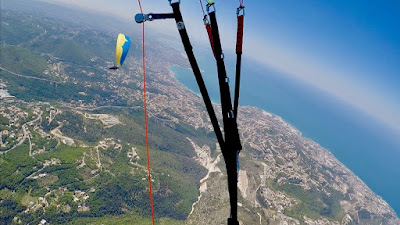 I flew next to a Mentor 5, Alpina 3, and some good gliders in their respective categories, in still and also in moving air. 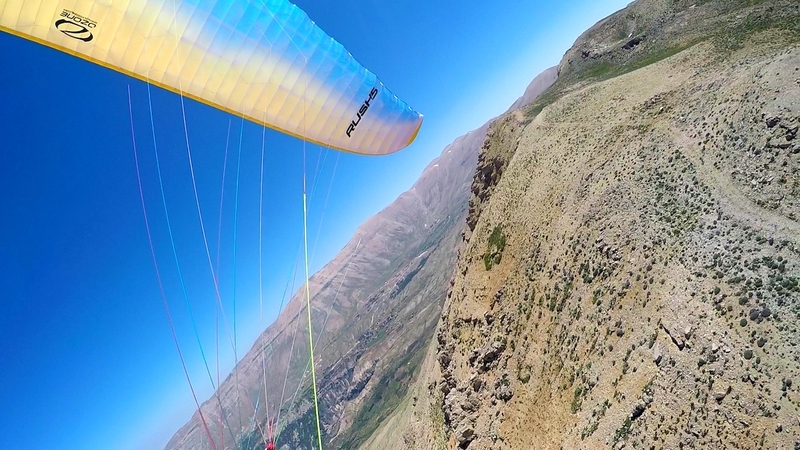 Doing some glides in still air, there are no difference in glide between the Mentor 5, Chili 4, and the Rush 5. 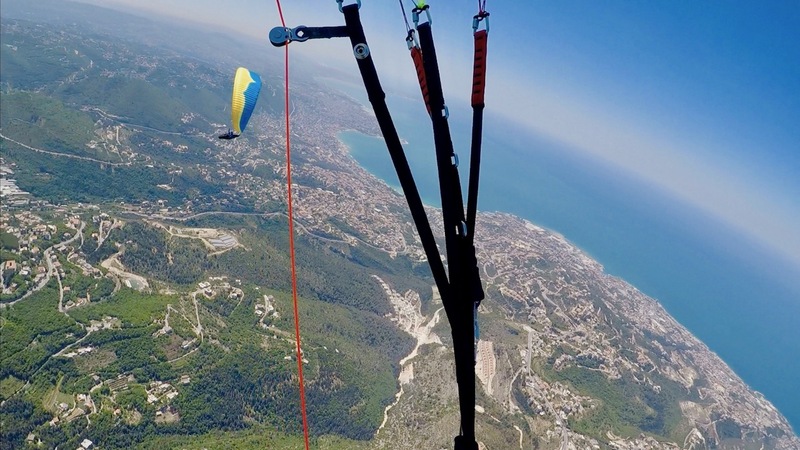 But when conditions get more tricky, and in XC conditions when i was flying in real air, it seems that the Rush 5 gave me the most complete package for performance efficiency even by a tiny margin. It's like those magic gliders that can always deliver. I mean that the Rush 5 has very good comfortable movements with great ability to cut through without minimum loss of altitude in moving air. I also think that the Rush 5 thermal ability is really impressive, putting this glider at the ‘very’ top of the high-B category, in weak and also in strong thermals. The Rush 5 doesn’t really dive in turns. The turn is a performance oriented one, very balanced between agility and efficient climb. In weak thermals, i can confirm that the Rush 5 MS is indeed a floater. In strong cores, the Rush 5 doesn’t pitch back at all neither pitch forward aggressively. It does cut through every thermal with ‘peace’, enters and climbs without delay in any core ! That’s ‘la creme de la creme ‘ when it comes to a balance thermal behavior for a high B. In turbulence, i felt that the Rush 5 need less active piloting than the Rush 4, just because the Rush 5 ability to auto stabilize itself, with a non event efficient flying, that i think many pilots would be surprised by it’s serene ability to deliver top performance for even week end pilots. Also, i think higher rated pilots will find a very cool, super efficient tool, much easier to fly than the Alpina 3, which is easy for a C, but with all the performance package. The difference in overall performance in active air between the Rush 5 and the Alpina 3 is very small, and will be felt only in head wind long glides, by a little margin. What was felt in difficult conditions, could only be understood by good pilots. The Rush 5 behaves in efficiency, like a higher rated glider in cutting the airmass efficiently and climbs up and dig forward, like going on stairs but with a huge comfort over the higher rated ones. The pressure on the bar is higher than the one on the Rush4 and the top speed is around 12 km/h over trim. The performance at full bar is also very impressive at the top of the B category. The use of the speed bar is easy in turbulence and very efficient. The Rush 5 filters the air, cut through, glide with a very solid leading edge. Ears are stable, and a good way to get down. Wing overs builds quickly. Inducing an asymmetric collapse without even touching the opposite brake, the Rush 5 behaves like an A glider. Frontals tends to make sometimes a front rosette, but it opens fast with no loss in altitude. 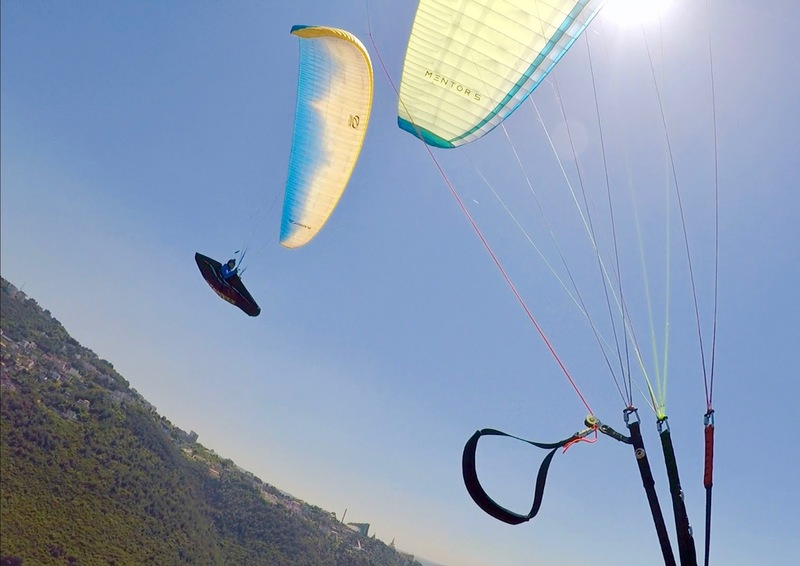 The slow flying characteristics are available to land accurately in tiny places with a forgiving brake length. Conclusion: The new generation of pilots are super lucky to fly today’s B gliders. Those performance were never seen 10 years ago, even on a competition glider! Adding the excellent comfort and the ability to surf the air. 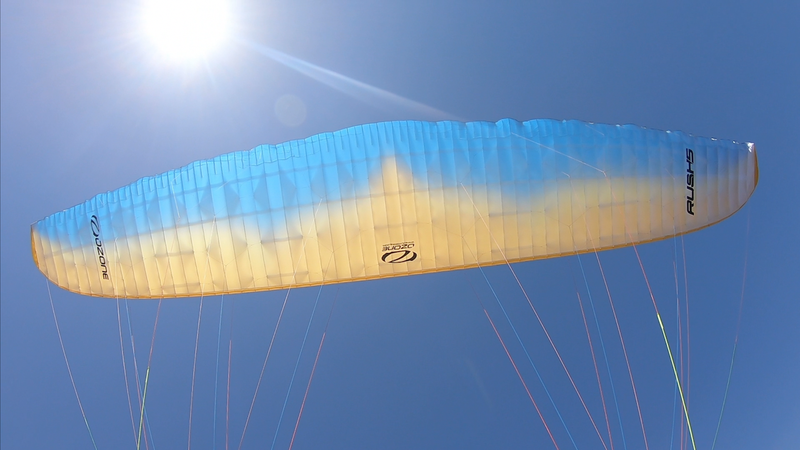 The Rush 5 is an excellent choice for people upgrading after two seasons on a low or mid B glider. I cannot consider it as 'demanding to fly' for a high B...But for sure Ozone placed it into that box. In the High-B category, the Rush 5 is a "comfortable and accessible high B, with top overall performance" in that category in turbulent and active real air with usable and very good performance! For all that complete package with probably a tiny edge... IMHO, the Rush 5 ‘could be’ the best B glider ever created till this date. After the MS test, i flew the S size from 82 to 85 all up. The launching and the overall handling is similar to the MS size. Usually small sizes are different and could behave differently. Not the Rush 5 S. It feels calm and reassuring like the MS size. The ability to turn it is also very similar even at 85 all up. The way it sniffs the thermal at max load is impressive also.It's still efficient without any dive in the turn. Overall the Rush 5 S size is like its bigger sister a Gem for XC use. Using the bar in turbulence is very usable and easy. Ears are efficient and stable.They reopen without pilot input. If you have a very efficient 4X4 for everyday use, and also very comfortable in bumpy dirt roads...then it will be similar to the Rush 5. Thanks for the amazing review Ziad.Can you update the en B comparison and maybe put up a video? What's the difference between Rush5 and Nyos Rs? I will take one of them..
Hola Ziad..!muy bueno su blog es un gusto leerlo..! Vole el R4 desde su lanzamiento con carga de 88 kg ..cree que R5 sera igual de flotador en termicas debiles.? si vuelas la MS a los 88 seguramente flotará en térmicas débiles. I'm anxious to see the tequila 5 review. May I ask when you will post it? hi Ziad. Thanks for the great review. Im comming from an Artik 2 glider and would like to change it to a iota 2 or rush 5. Cant make up my mind which one to buy. I could test the Iota 2, which impressed me, unfortunatelly the rush 5 i cant get a test on. In your oppinion if you had to choose from the 2 gliders, after comming from artik 2, which one would you choose? Hi, both are really nice gliders with insignificant difgerence..if any..
Look for the one that suits ur all up weight and budget.